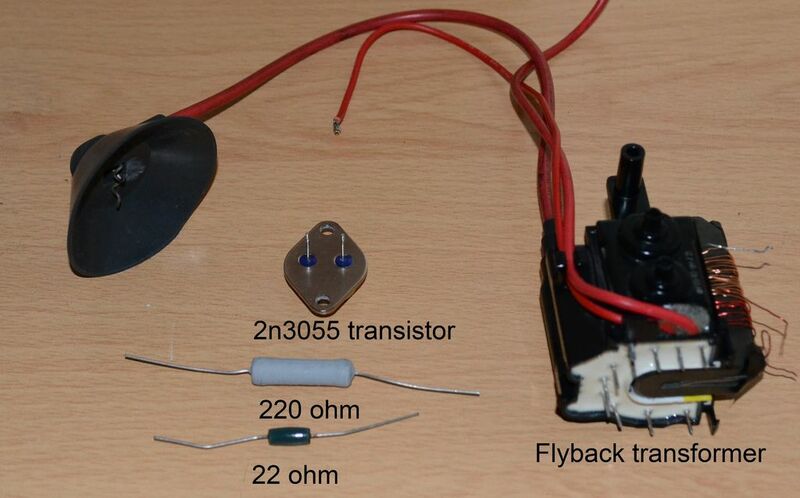 This instructable will show you how to make a cheap and simple driver circuit in order to get high voltage arcs out of a component called a flyback transformer. A flyback transformer, sometimes called a line output transformer are used in older CRT TV's and computer monitors to produce the high voltage needed to power the CRT and electron gun. They also have other auxiliary windings built into them that the TV manufacturers use to power other parts of the TV, so they are usually customised by the manufacturers. For the high voltage experimenter they are used to make high voltage arcs, which is what this instructable will show you how to do with just a few simple electronic components. You can get flyback transformers out of older CRT monitors and TV's. They are the ones that have a big heavy chassis. There are also other instructables on this website showing how to remove them from the chassis and circuit board. I am in no way responsible if you mess up with this circuit. If you mess up you have no one to blame but yourself. (Note: The resistor values do not have to be exact. Say if you had a 33 ohm and a 200 ohm resistor they would still work fine for this circuit). Some enamelled magnet wire, single core bell wire also works well too for the primary and feedback coils. such as alligator clipped cables or wire and solder. Mount the transistor onto the heat sink. The heatsink is important as the transistor gets hot. I just bought the cheapest heatsink maplin sell. The 2n3055 is a TO-3 case style. You can use an insulator pad if you want but I just used a small amount of old thermal grease I had lying around. To mount the transistor to the heatsink I just used some spare screws and nuts I had in the garage. Make sure that the transistor pins do not physically touch the heatsink and it is screwed in securely. Q: Can I use a different transistor? A: Yes you can, as long as the transistor has similar specs to the 2n3055 or better. Q: Can I use a PNP transistor? A: Yes, but you will have to reverse the collector and emitter connections in order for it to work. It will also need to have similar or higher specs as the 2n3055 transistor. Q: Is the heatsink really needed? A: Yes, if you are wanting to use this circuit for more than a few seconds the heatsink is vital as the transistor will get hot fast. Q: Can I use a MOSFET? A: No, a MOSFET will not work for this circuit. Using some enamelled magnet wire wind two coils around the core of the transformer in the SAME DIRECTION. 11 turns primary and 7 turns feedback is a good starting point but you can try more or less windings to see what gives the best results. Using a sharp knife carefully scrape away the enamel coating from the very ends of the magent wire. Once you have wound the coils and removed the enamel at the ends of the wire check for continuity using a multimeter, doing this can save you lots of bother later on! You do not need to worry about finding the HV return pin yet. Connect all of the components together as shown in the images above. In the graphical diagram, the red coil is the primary coil with one end connecting to the positive "+" of the power supply/battery, the other end connects to the transistors collector which is actually the metal casing of the transistor itself. The green coil is the feedback coil with one end connecting to the middle point of the two resistors, and the other to the transistors base (looking at the transistors underside this is the pin on the left). If you have some alligator clipped wires then you can use these for temporary connections whilst you familiarise yourself with the circuit. Check to make sure that your circuit is connected up correctly. You can use a multimeter set to measure continuity or resistance to make sure that everything is making good electrical contact. I strongly urge you to make a "chicken stick", which is a 1 foot long minimum insulating stick of some sort. PVC pipe is very good for this. Wood is fine too but when damp it becomes a good conductor at high voltages. Secure an electrode of some sort onto the end of it, sharp pointed nails work well and will give slightly larger arcs than rounded electrodes. You can then attach a wire of some sort to the chicken stick electrode the other end will be attached to the HV return pin on the flyback transformer. Including the obvious risk of electric shock another thing to take note of is that the arc is VERY hot and can easily set to fire to anything that it touches. Even the cable insulation will burn if you draw the arc onto it. So if you insist on burning pieces of paper or other objects take that into account and have some way of putting the fire out. You should never touch the high voltage wire or any of the flyback base pins when the circuit is turned on. Make sure that you can easily disconnect the power to the circuit. Do not use this circuit on an unsuitable surface such as a metal table or flammable surface. The transistor heat-sink can get hot so watch out not to burn your hand on it. Keep any high voltage cables away from other parts of the circuit and low voltage cables. Keep pets away. As well as the risk of shocking your pet from the sparks many household pets like to chew things such as wires. Following those basic safety steps you will be fine. I am no way responsible if you mess up with this circuit. To power the circuit you can use any 12V source that can supply a minimum of 2 amps, as a rule. AA battery's in series can be used but they will not last long and the arc length will get smaller and smaller as they drain. x2 6v lantern battery's can be used and will power this circuit nicely for a decent amount of time before the arcs start getting smaller. A 12v lead acid battery is a very good way of powering this circuit and what I personally use. A 12V power supply can also be used providing that it can deliver 2 or more amps. I do NOT recommended 9v /PP3 battery's as they will not last long at all and even when new are unable to provide the current needed for a decent sized arc. To find the high voltage return first attach your chicken stick to the high voltage out (the big thick red wire) and turn the circuit on. You should hear a high pitch noise. If you don't here this noise then go to the trouble shooting page at the end. Bring the chicken stick close to the base pins on the flyback and go past each one individually. Some of them may give a slight spark but one of them should give a solid constant HV arc, this will be your HV return pin. You should now disconnect your chicken stick from the HV out and connect it to the HV return pin instead. In the image's above are some arcs produced by my 2n3055 driver and some different flyback transformers, most flybacks will only give around a 1-2cm arc on 12V input and upping the input voltage only increases heating on the transistor in my experience. Have fun and remember not to run this circuit for periods longer than 1 minute as the transistor gets hot fast. Now that you have your driver made and working you are probably thinking "what now?". Well some things you can do include soldering your driver components onto a single piece of strip-board or making a high voltage capacitor and getting loud sparks. You can also make a small Jacobs ladder by placing two vertical pieces of bare wire close to each other with a small gap at the bottom that gets wider at the top. Step 9: So How Does It Operate? Note: this is what I think is happening with this circuit, if someone with more knowledge could correct me in the comments I would be more than grateful to know! When you first apply power to the circuit a small amount of current starts flowing through the voltage divider resistors and feedback coil and into the transistor base, as part of this current path is wound around the ferrite core (feedback coil) it stores some inductive energy in the core. As current is now flowing through the base the transistor is now forward bias which turns it on. Current then starts flowing through the primary coil and into the transistors collector and out of the emitter (conventional current flow BTW). Current will keep building up in the primary coil until core saturation occurs. This takes the voltage of the feedback coil down to almost zero and the transistor falls back into its linear region. As the transistor turns off, the magnetic field in the feedback coil collapses which creates both a high voltage pulse in the secondary coil and a small voltage boost in the primary coil (this is why the transistor has to be a high voltage transistor). As the induced current is in the opposite direction to the supply current i am thinking this serves a current limiting action to the circuit, which might explain why it only seems to draw 2 amps max. If this was a non-inductive load then the transistor turning on would effectively be shorting the power supply right now. As the transistor turns off the magnetic energy stored in the core from the primary coil rapidly collapses giving an even higher voltage pulse on the high voltage secondary coil. The process repeats its self thousands of times per second. Please correct me in the comments if I got any of this wrong! Ok so you have made the circuit and it either does not work or it does not work very well. If nothing happens and you cannot hear any high pitched noise from the flyback transformer then try reversing the connections to the primary and feedback coils, if you still get nothing try just changing the connections on one of the coils. Usually this resolves that issue. If you have tried that and still nothing then you should check the circuit and make sure all connections are secure and nothing is shorting out. Sometimes people will forget to remove enough enamel on the magnet wire primary and feedback coils and there will be no electrical connection being made. If it works but the arc is small try reversing both the primary and feedback coil connections. Remember that around 2cm is the maximum arc length you are going to get out of this driver, and 1cm may also be the maximum on some flybacks. Skip to 0:44 in this video to see some arcs. I think probably you did not grasp the values here. Usually in open air, each mm of space needs 1000 Volts to make a spark jump. So if you see a 2cm spark, it means around 20,000 volts. Voltage increase as current decreases. So if you provides 12V @ 2A, probably you are getting 20KV @ 1,2 milli Ampère. Do your homework and figure it out what exactly do you need. Instead of a 220ohm 5 watt resistor . Coils should be made in oppposite directions. I am trying to help my son with his science project which includes making the arc and then comparing different shaped electrodes. We are having a problem finding the flyback transformer. Is there another transformer that would work? If this were a normal transformer you would be right in saying that more primary turns would give fewer secondary volts but this is like a car's ignition coil and like that coil it operates on the principle of stored energy, that energy is defined as 1/2 Li^2, where L is the inductance of the primary winding and i is the current through it. As you increase the number of turns the inductance also increases resulting in more energy being stored and subsequently released into the secondary winding = bigger spark. I hope that helps in understanding the apparent paradox. can i use voltage multiplier with this ,will it work?? what happen if i use 2 or more transistor or greater then 2n3055 and more resistors of same value that you suggested us and a more powerful diodes.is it sufficient to drive out 30kv. if not then can you please suggest us what to do for driving 30kv output from a fly back transformer of a monitor. can i use transistors ,diodes ,capacitors ,resistors etc from my monitors circuit board. Can you please suggest me what to do for driving 80kv output from a fly back transformer.